Do you hate standing in the kitchen chopping vegetables and salad? I do! Cutting vegetables which can be very a long and tedious task especially after a long day at work. Well look no further, you have just found the perfect device. Presenting; Ganesh Vegetable & Fruit Chopper Cutter With Free Chop Blade & Cleaning Tool. Save that valuable after office time with your family and friends rather than chopping up vegetables in the kitchen. This amazing product actually works and helps me cut vegetables and salad in minutes. Also, I love to present the food I cook in a particular way, so that it looks more appetizing. But doing so can consume a lot of time because I am not a professional chef and cutting vegetables is time consuming. As soon as I laid my eyes on this product, I knew I had to have it. So, I ordered it from Amazon, it was nicely packed and the order was delivered the next day. Now, I don’t have to worry about my friends showing up at the last moment, I can still put some presentable dishes in front of them. 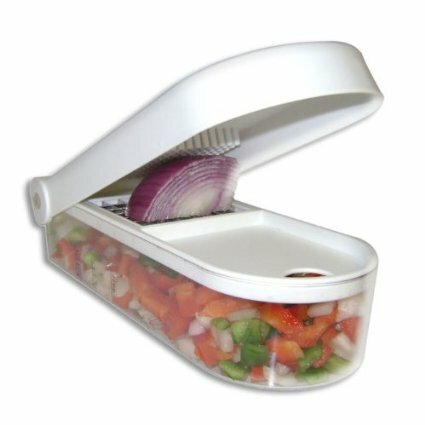 It is very easy to use as it comes with a detachable container, which can also be used to store cut vegetables and fruits. The cleaning tool provided inside the box does wonders. I no longer have to worry about cleaning the chopper. The blade is made up of stainless steel and is ideal for onions, potatoes, mushrooms etc. This product is very economical and I bought it for Rs 280 after a discount of 54% on Rs 610.